Before I turn around I'll be going in for hip replacement surgery. From what the surgeon tells me I can expect to be in the hospital for four days and then be in a rehabilitation facility for about two weeks. Oh, and what I just found out is that I have to be at the hospital at 7:00am - surgery is scheduled for 8:30 AM! In the good old days you were admitted to the hospital the DAY BEFORE the surgery. Now the hospital saves money where ever they can and sleepyheads like me have no choice but to show up THE DAY OF THE SURGERY at the crack of dawn. When I return home I'm sure I will have all kinds of people showing up, nurses, therapists and social workers, but no cooks. With that in mind, the other day I was inspired to do something I haven't done in a very long time. I cooked!!! 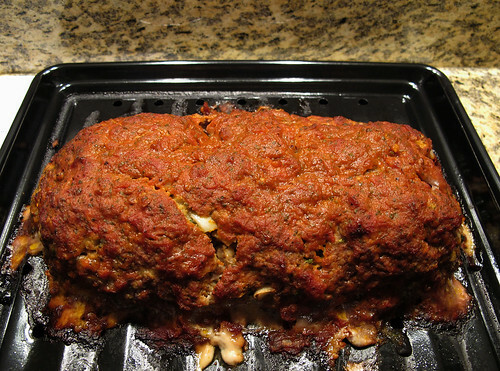 I had a pound of hamburg in the freezer, defrosted it, and made a meat loaf. Well, I happened to have two sweet potatoes on hand, so I tossed them in too. While I was at it I thought of the apples that I have had in the refigerator for a while. Why not bake some apples while the oven was on? I mixed up some cinnamon, sugar, raisins and a little cranberry juice and poured it over the apples. While all this was baking in the oven, the kitchen had such a delicious aroma. Once the meat loaf was done I sliced it into six generous portions and placed them in individual freezer containers. When the sweet potatoes cooled, I mashed them up with some butter and added a serving to each dish. Into the freezer they went for use when I won't be inclined to cook. As far as the baked apples, I've been enjoying them every now and then, sometimes I top an apple with a splash of cool-whip. Yum!! I enjoyed my session in the kitchen and hope to do more "filling up of the freezer" soon. Millie shares her tip for keeping milk in the freezer in case of emergency! It was 90 degrees when I flew into Boston on Wednesday! It never even hit 80 degrees the entire winter while I was in Florida. Go figure. The Jet Blue flight was as smooth as silk, left on time and came in earlier than scheduled. After Steve picked me up, we went out to dinner and then to a supermarket for the basics. First thing that Steve does for me is connect my computer. First things first! When I started to use the kitchen sink I noticed a puddle gathering on the counter top. The next morning I called my maintenance person, he took a look and saw there was a lot of corrosion around the faucets and found a puddle under the sink! The next afternoon he put in a new set. It's good looking, does not leak but who wants to deal with this when you first come home! Two days before I left for Florida I had the car transport company pick up my car. Usually it takes between six to eight days for delivery. This time I received a call early on the fifth day, they had my car and would deliver it that morning. By the time the car arrived it had started raining and as the day progressed it was raining buckets. It was raining way to hard to unload the car so I had to wait until the next day for that operation. Now that my car is unloaded I have the huge job of unpacking and getting things put away where they belong! That's why I say, "I'm back, sort-of." For your birthday, I'm sending you a box of chocolates! There is a line in the movie "Forrest Gump" that Tom Hanks delivers that says it all. "Life is like a box of chocolates. You never know what you are going to get." 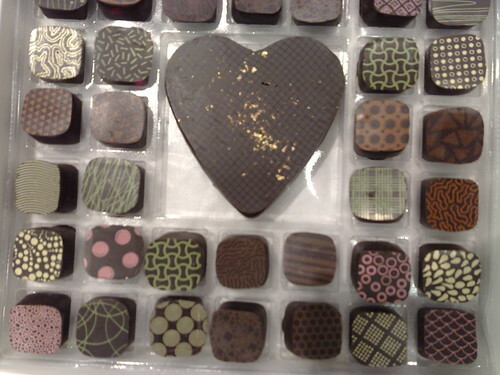 In this box of chocolates I hope you find what you are looking for. No pieces that are hard, chewy, bitter, or full of nuts. Hope you find only good looking, tasty, sweet and satisfying chocolates that will be good for your health and life as you celebrate another year.